I always like to look for special gift for my wedding anniversary, or the anniversary of when I met my husband. Last year, we named a star together. It’s one of the ones in Orion’s belt and it’s called Shalex. I know it’s not official and these star naming sites are just a bit of fun, but it felt special. One year I used my writing and publishing abilities to create a one-off book for my husband about our own love story. There’s only ever going to be one copy available. 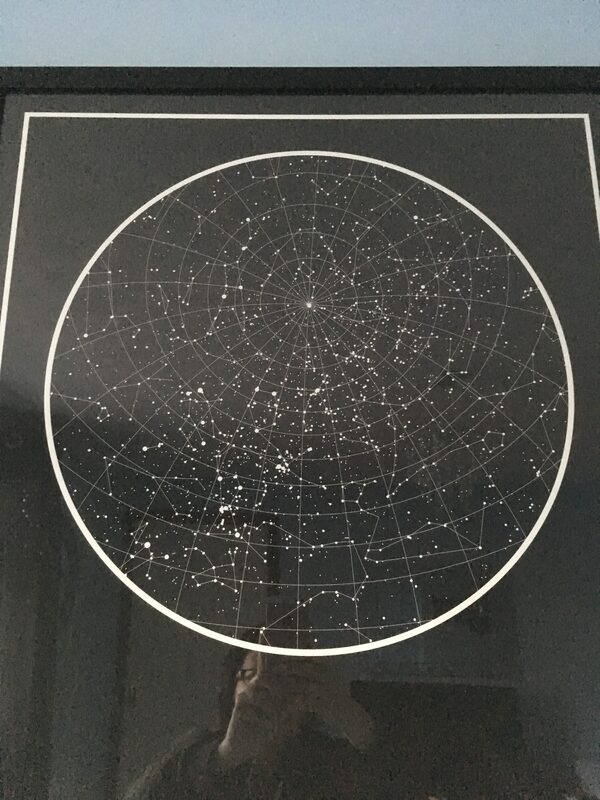 Last year, we bought a special star chart from The Night Sky. Here’s what I thought. Firstly, The Night Sky have not paid me for this review. In fact, they don’t even know I’m writing it, so you can be assured that it is a totally honest and impartial viewpoint. I first heard about them through an Instagram advert and I clicked, thinking it was an interesting idea. 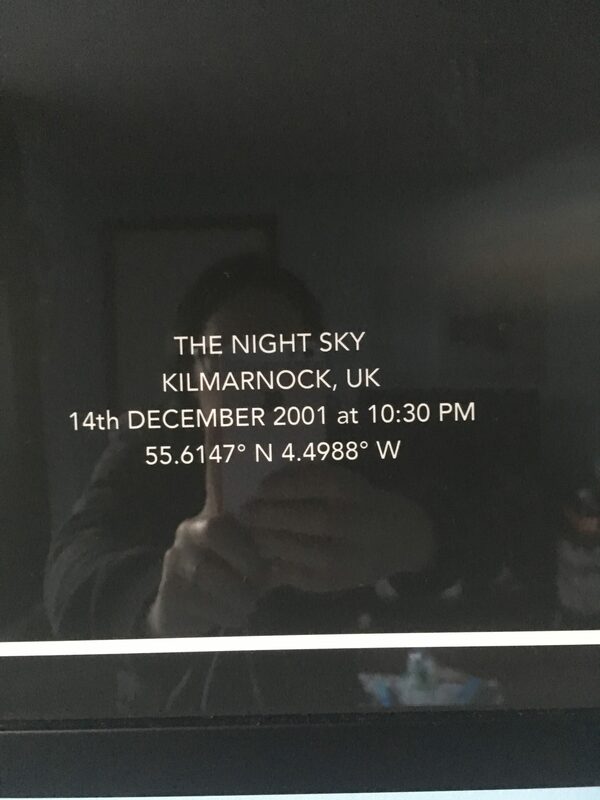 You can choose any date and any location and they’ll provide a large chart of the sky at that time and location. I chose 10:30pm on 14th December 2001, which is roughly the time when we met. I chose Kilmarnock as the location because that’s where we met. You can choose black with white text and images or white with black text and images for your star chart. I chose black with white because it suits the decor in my living room and it’s my own personal preference. I like the idea. It’s really romantic, but you could choose it for any major event in your life. I would love to have one made up with the date and location of my son’s birth – or conception. 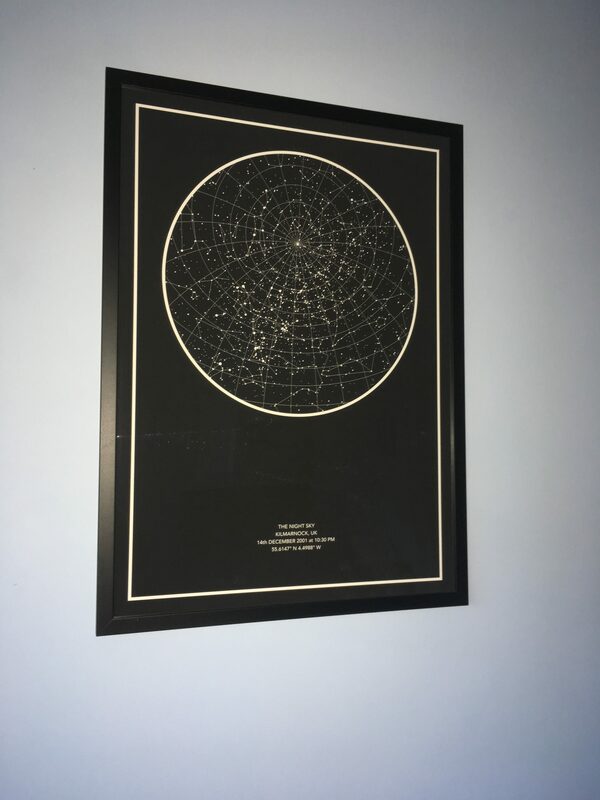 I might even consider having a chart made up for the time when my husband proposed because we both remember looking up at the stars that night. It’s just a really cute idea. It’s not really a down side or a negative, but the chart is much larger and heavier than I expected. Also, it cost around £100 for the chart and delivery, which is a lot more than I would pay for a standard picture for my living room. The only reason I did pay this much is because it’s personalised and unique to us and our relationship. It probably wouldn’t mean anything to anyone else. Overall, I would recommend ordering your own star chart. It takes about a week for delivery, is shipped from the Republic of Ireland (so keep that in mind when you’re ordering to a set timescale) and would make an excellent gift for a special couple and it would be a really sweet thing to hang in your baby’s nursery. I’ve seen these all over the place, and I think they are so cute! I’ve always wanted one but I just can’t decide which date/sky I want… Maybe I’ll decide some day!